Preheat oven to 425. Place quinoa in a saucepan, and add enough water to come ¼-inch above the quinoa. Bring to a boil, cover and reduce heat to the lowest setting. Simmer 10-15 minutes or until all of the water is absorbed. When done remove from heat, keep covered, and let sit at least 5 minutes. Continue with next steps. In a mixing bowl, combine seasoned chia seed binder with water (see note). Set aside at least 5 minutes. On one half of a foil-lined baking sheet, toss carrots with olive oil, HALF of the cumin, salt & pepper. Place chicken on the other side of the baking sheet, and season with remaining cumin, salt & pepper. Once oven has heated, roast for 10 minutes, then toss, and roast another 5-10 minutes or until chicken is cooked through. Add cooked quinoa and cauliflower rice to the bowl with the chia seed binder. Mix thoroughly to combine, season generously with salt & pepper, and use your hands to form patties (about 2 per person). Heat enough oil to coat the bottom of the nonstick skillet over med-high heat. When oil is hot, place patties into the skillet in one layer (work in batches if necessary). Cook, turning once, 2-4 minutes per side, or until crispy on the exterior and heated through. If needed, add more oil to the pan, or reduce heat if they are browning too fast. Pour lemon vinaigrette base into the bottom of your salad bowl and add an equal amount of olive oil. Whisk or mix with a fork to combine. If this looks like too much dressing, remove some before adding the arugula. Toss gently and season with salt & pepper to taste. Divide arugula between plates, top with roasted carrots and sliced chicken. Enjoy quinoa patties and herbed-lemon yogurt on the side. Notes: When mixing water with chia seed binder use: 3 tbsp for 2 portions, 6 tbsp for 4 portions, ¾ cup for 6 portions. This entry was posted in Meal-Kit Recipes, Meat, Poultry on January 31, 2016 by Megan Rappe. Rinse the whole head of salanova lettuce, shake off excess water, and turn upside down on a towel to dry. Peel tangerine and separate into segments. Cut each segment in half. Remove seeds if needed, they should be nearly seedless. Set aside. Heat a small amount of oil in a skillet over medium heat. Season both sides of chicken with salt & pepper. When oil is hot, add chicken to skillet and cook about 5 minutes per side or until cooked through. Remove from skillet, and tent with foil to keep warm. Add tangerine segments to hot skillet and sauté over medium heat, stirring occasionally. Once tangerines have lost their shape, add ginger-scallion sauce and an equal amount of water. Simmer until slightly syrupy, remove from heat. Meanwhile, transfer brown rice to a microwave-safe bowl and heat in 30-second intervals until hot. Pour miso-honey vinaigrette base into the bottom of your salad bowl and add an equal amount of olive oil. Whisk or mix with a fork to combine. Cut off the stem/root end of the salanova and then add the greens to your salad bowl along with edamame, toss to combine and season with salt & pepper to taste. Thinly slice chicken. 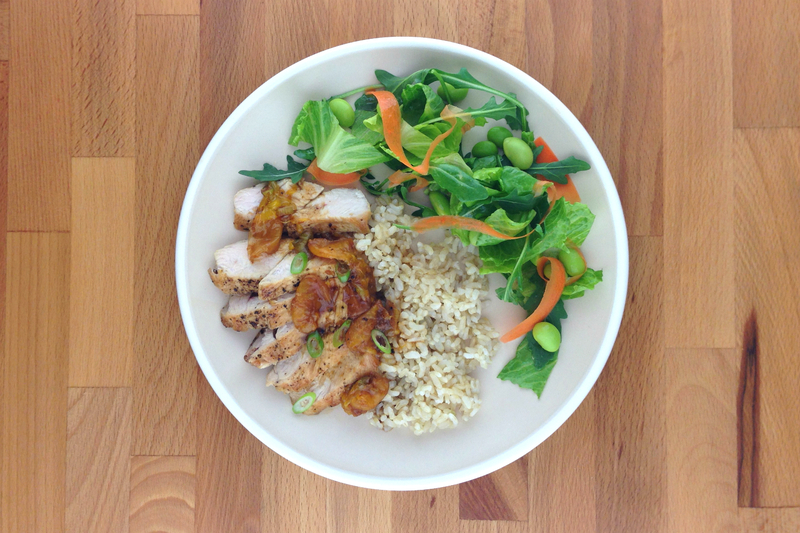 Divide brown rice between plates, top with chicken, and pour orange sauce over the top. Enjoy salad on the side. This entry was posted in Meal-Kit Recipes, Meat, Poultry on January 23, 2016 by Megan Rappe. Place lentils in a saucepan and cover with water by about 1-inch. Bring to a boil over high heat. Cover, reduce heat as needed and simmer about 20 minutes or until lentils are tender. Once lentils are tender, drain any excess water. Heat a small amount of oil in a skillet over med-high heat. When oil is hot, add the ground beef and onion. Cook until meat is no longer pink and onion is tender. Use a spoon to break up the meat as it is cooking. Meanwhile, pour vinaigrette base into the bottom of your salad bowl and add an equal amount of olive oil. Whisk or mix with a fork to combine. If this looks like too much dressing, remove some before adding the arugula, sliced radish, pickled onion and feta. Toss gently and season with salt & pepper to taste. Add chorizo spice blend and lentils to the skillet. Stir to coat everything with spices and continue to cook 1-2 minutes or until spices are fragrant. Season to taste with salt and remove from heat. Just before serving, heat tortillas. If you have a gas stove, you can place tortillas directly over the burner and turn with tongs. Don’t step away…they char quickly. Alternatively, warm in a dry skillet, or in the microwave. 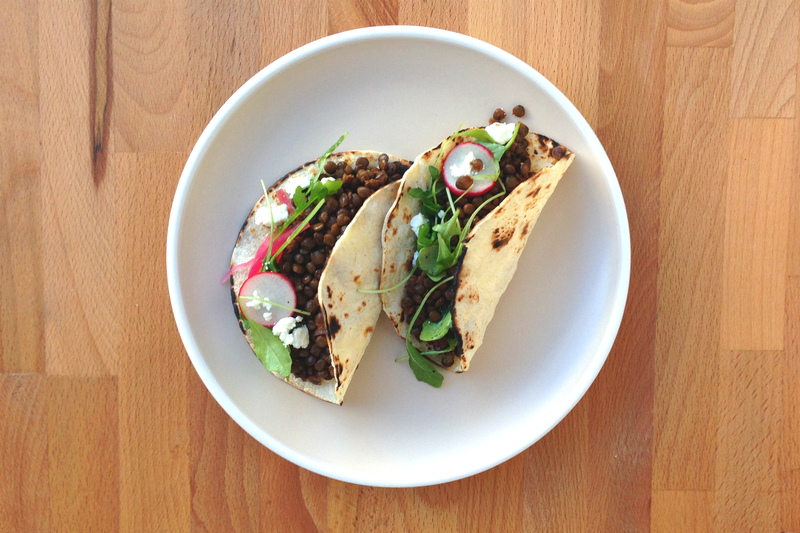 Fill tortillas with chorizo-spiced beef & lentils. Top tacos with some of the arugula salad and enjoy any remaining salad on the side. This entry was posted in Beef, Meal-Kit Recipes, Meat on January 23, 2016 by Megan Rappe. Slice brussels sprouts in half. Rinse well, and set on a towel to dry. On baking sheet, toss brussels sprouts with olive oil, salt & pepper. Roast 8 minutes, then toss with a spatula and sprinkle pistachios over the top. Return to oven for another 8-10 minutes, or until brussels sprouts are tender and crispy at edges. Continue with next steps after you’ve tossed the brussels sprouts. Heat a skillet over high heat. Season both sides of steak with salt & pepper and rub with olive oil. When skillet is hot, add steak and cook 3-5 minutes per side for medium-rare. You should see a nice crust on both sides. Transfer to cutting board, tent with foil, and rest up to 10 minutes. Transfer cherry compote to a microwave-safe bowl and heat in 10-second intervals until warm. Pour vinaigrette base into the bottom of your salad bowl and add an equal amount of olive oil. Whisk or mix with a fork to combine. If this looks like too much dressing, you can remove some at this point before adding the greens. Toss gently and season with salt & pepper to taste. After steak has rested, slice across the grain to ensure a tender bite, and serve with warm cherry compote. Enjoy brussels sprouts and salad on the side. This entry was posted in Beef, Meat on January 17, 2016 by Megan Rappe. Rinse and drain chickpeas. Place in a mixing bowl along with the kung pao sauce. Stir to coat the chickpeas, and set aside to marinate, stirring the mixture from time to time. Place quinoa in a saucepan, and add enough water to come ¼-inch above the quinoa. Bring to a boil, cover and reduce heat to the lowest setting. Simmer 10-15 minutes or until all of the water is absorbed. Meanwhile, thinly slice scallion. Dice bell pepper into ½-inch pieces. Cut chicken into 1-inch pieces and season with salt & pepper. When quinoa is done remove from heat, keep covered, and let sit at least 5 minutes before adding the sliced scallion and fluffing with a fork. Keep covered while you cook the chickpeas. Heat a small amount of oil in a skillet over med-high heat. When oil is hot, cook chicken to brown the exterior, about 3-4 minutes. Add onion and diced bell pepper. (If you like extra heat, add a big pinch of red pepper flakes.) Cook stirring occasionally until onion is tender and beginning to brown at edges, and the chicken is cooked through. Reduce heat to medium and add chickpeas along with the kung pao sauce, scraping the bowl to get all of the sauce into the skillet. Add water (see notes). Continue to cook, stirring occasionally until chickpeas are warmed through. Taste and season with salt if needed. Divide quinoa between serving bowls and top with kung pao. Finish with a sprinkle of peanuts. Enjoy! Notes: When adding water to the skillet with the kung pao chickpeas, use the following amounts: ¼ for 2 portions, ½ cup for 4 portions, ¾ cup for 6 portions. This entry was posted in Meal-Kit Recipes, Meat, Poultry on January 17, 2016 by Megan Rappe. Preheat oven to 400. Rinse the whole head of salanova lettuce, shake off excess water, and turn upside down on a towel to dry. Thinly slice fennel, set aside. On a baking sheet, toss squash with olive oil, salt & pepper. Once oven has heated, roast for 10 minutes, then toss, and roast another 5-10 minutes or until golden and tender. Meanwhile, season both sides of chicken with salt & poultry seasoning. Heat a small amount of oil in a nonstick skillet over medium heat. Cook chicken about 5 minutes per side, or until cooked through. While chicken is cooking, pour vinaigrette base into the bottom of your salad bowl and add an equal amount of olive oil. Whisk or mix with a fork to combine. Slice grapes in half and add to bowl along with fennel. Cut off the stem/root end of the salanova and then add the greens to your salad bowl, toss to combine and season with salt & pepper to taste. Slice the chicken, divide between plates and spoon some of the pan sauce over each portion. 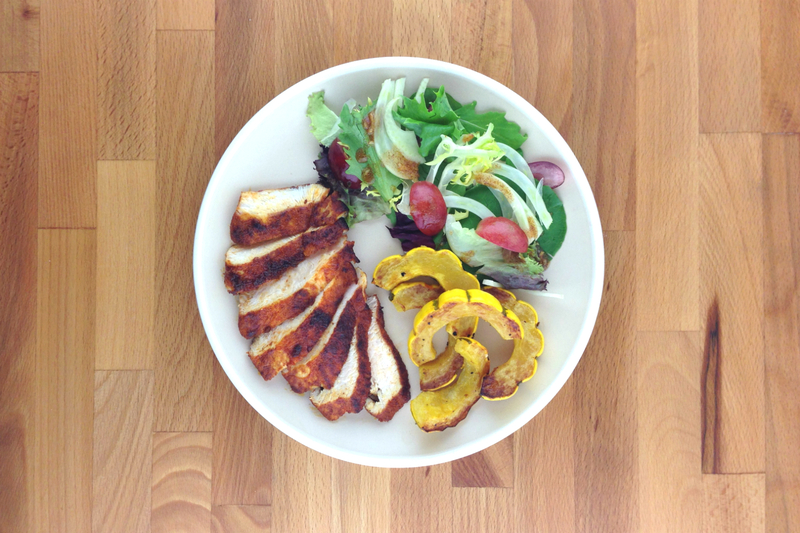 Enjoy the roasted squash and salad on the side. This entry was posted in Meal-Kit Recipes, Meat, Poultry, Seasonal, Winter on January 10, 2016 by Megan Rappe. Heat a small amount of oil in a nonstick skillet (medium for 2 people, large for 4-6 people) over med-high heat. When oil is hot, add the ground beef and use a spoon to break up the meat as it is cooking. When beef is no longer pink add the onion & bell pepper mix. Cook 3-5 minutes, stirring occasionally or until vegetables are tender and golden around the edges. Meanwhile chop garlic, and set aside. When onion & bell peppers are tender, add spice mix to the skillet and cook for another minute. Next, add tomatoes, chopped garlic, and chili flakes (to taste). Reduce heat to medium, cover, and simmer 10 minutes. While shakshouka sauce is cooking, place kale in a large bowl, and add lemon dressing base. Drizzle in a good amount of olive oil, and add a generous sprinkle of salt. Give the kale a gently massage…literally! Knead the kale with your hands, until it becomes soft. (The volume will also drastically decrease.) Top with almonds and pecorino. Once sauce has simmered 10 minutes, taste for seasoning and add salt if desired. Begin to crack eggs into pan. You can make a shallow nest for each egg in the sauce…just be sure the egg isn’t touching the bottom of the pan. Cover, and leave to cook over medium heat until desired doneness – about 3 minutes for soft runny yolks or 5 minutes for well done. When serving be careful to scoop all the way under the egg. Enjoy the kale salad on the side. Notes: “Shakshouka” is a popular Israeli dish that can be enjoyed for breakfast, lunch, or dinner. Similar dishes can be found all over the globe – huevos rancheros in Mexico, pisto manchego in Spain, and ratatouille in France. 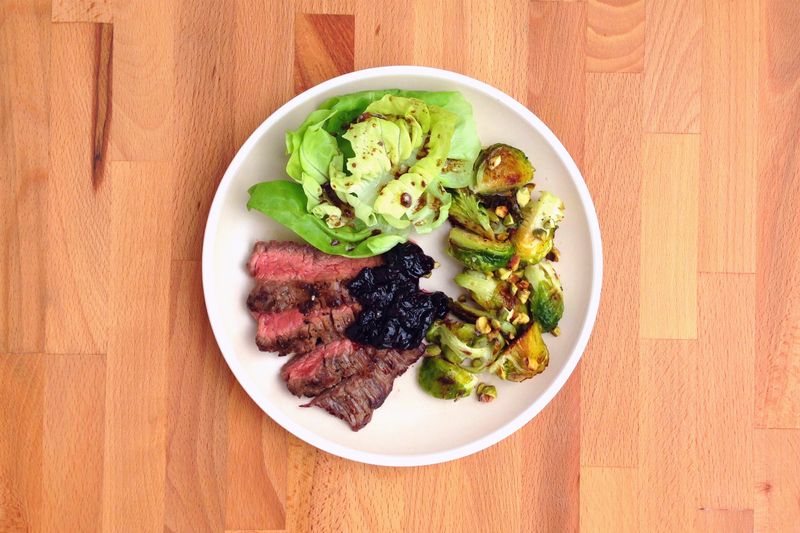 This entry was posted in Beef, Meal-Kit Recipes, Meat on January 10, 2016 by Megan Rappe. Once potatoes are done, heat a small amount of oil in a skillet over med-high heat. Season both sides of pork with salt & pepper. When skillet is hot, add pork and cook 2-3 minutes per side. Transfer to cutting board, tent with foil, and let rest. While pork is resting, pour lemon vinaigrette base into the bottom of your salad bowl and add an equal amount of olive oil. Whisk or mix with a fork to combine. If this looks like too much dressing, remove some before adding the greens. Toss gently and season with salt & pepper to taste. 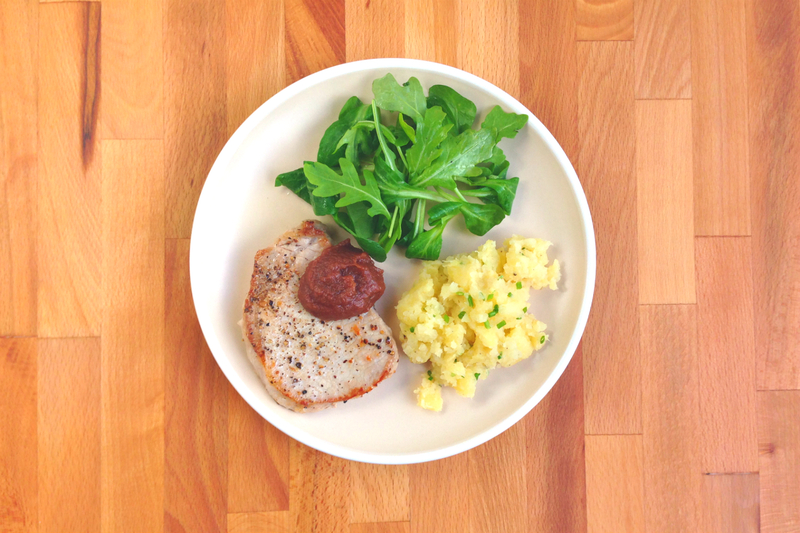 Once pork chop has rested a few minutes, slice and serve topped with a dollop of apple butter. Enjoy rustic mashed potatoes and salad on the side. This entry was posted in Meal-Kit Recipes, Meat, Pork, Seasonal, Winter on January 3, 2016 by Megan Rappe. Wash rainbow chard and give it a quick shake to dry. Remove leaves from the chard stems—do not discard the stems. Slice leaves into ½-inch ribbons and stems into ¼-inch slices. Rinse and drain the black-eyed peas. Slice garlic as thinly as possible. Heat a small amount of oil in a nonstick skillet over med-high heat. When oil is hot, add the holy trinity mix and cook 2-3 minutes. Add sliced sausage and continue to cook, stirring occasionally, until sausage is lightly browned. Add spice mix to the skillet and stir to coat vegetables. Stir in the black-eyed peas, brown rice and sliced sausage. Reduce heat to low, and cook until heated through, stirring occasionally. If the mixture seams dry, add 1-2 tablespoons of water. Season with salt to taste. Remove from heat, cover and keep warm. Heat a small amount of oil in a second skillet over med-high heat. When oil is hot, add rainbow chard stems and cook 5 minutes or until softened. Add sliced garlic and rainbow chard leaves, cooking quickly until leaves begin to soften. Stir in the sweet & sour vinegar mix, cooking another 30 seconds. Season with salt & pepper to taste. Serve the Hoppin’ John alongside the greens, or on top of them. Note: Hoppin’ John is a traditional southern dish, often eaten on New Years day to bring good luck. This entry was posted in Meal-Kit Recipes, Poultry, Seasonal, Winter on January 3, 2016 by Megan Rappe. Preheat oven to 425. On a foil-lined baking sheet, toss broccoli with olive oil, coriander & cumin mix, salt & pepper. Once oven has heated, roast for 10 minutes, then toss, and roast another 5-10 minutes. Cut radishes into quarters. Set aside. Meanwhile, heat a skillet over high heat. Season both sides of steak with salt & pepper and rub with olive oil. When skillet is hot, add steak and cook 3-5 minutes per side for medium rare. You should see a nice crust on both sides. Transfer to cutting board, tent with foil, and rest up to 10 minutes. While steak is resting, wipe skillet with a paper towel, or grab a second skillet if desired. Heat a small amount of oil over med-high heat. When oil is hot, add quartered radishes and season with salt & pepper. Cook, stirring occasionally, 2-3 minutes. Add radish greens, continue cooking until greens have wilted. Remove from heat. Slice steak across the grain, top with a pat of coffee butter. 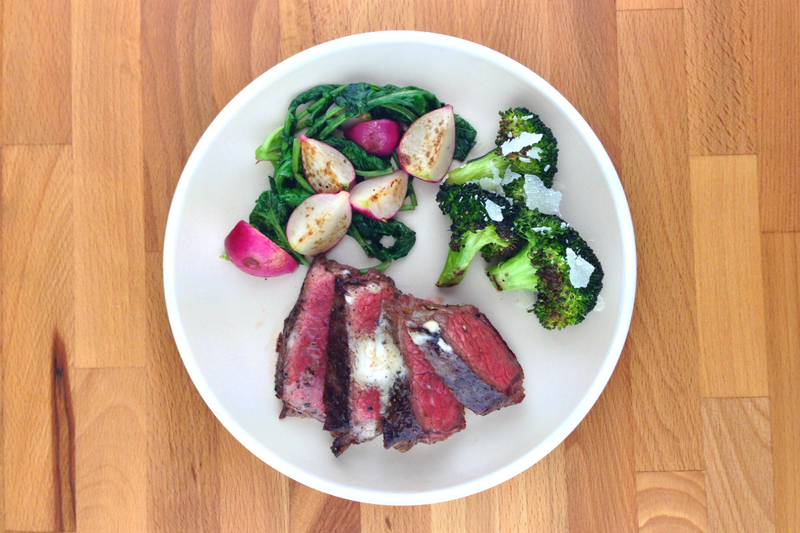 Serve roasted broccoli and sautéed radishes on the side. Note: There’s a lot of fancy food science behind the reason you should let a piece of meat rest. The most important thing is the result — when you cut into a steak after resting, the juices stay inside, rather than spilling out all over your cutting board. So if you like juicy steak, be patient…give it a rest! This entry was posted in Beef, Meal-Kit Recipes, Meat, Seasonal, Winter on December 13, 2015 by Megan Rappe.